The global data center market is estimated to reach revenues of around $174 billion by 2023, growing at a CAGR of approximately 4% during the forecast period. CHICAGO, IL, UNITED STATES, July 9, 2018 /EINPresswire.com/ -- Arizton’s recent market research report on the global data center market provides comprehensive industry analysis, trend forecasts, and competitive analysis. The research study segments the market by electrical infrastructure (UPS systems, generators, transfer switches & switchgear, rack PDU, and other electrical infrastructure), by mechanical infrastructure (cooling systems, rack, and other infrastructure), by IT infrastructure (server, storage, and network), by tier standard (Tier I & II, Tier III, and Tier IV), by general construction (building development, installation and commissioning services, building design, physical security, and DCIM), by geography (North America, Europe, APAC, Latin America, and MEA), and offers detailed competitive analysis. The increasing focus in the adoption of advanced technologies such as cloud-based services and IoT will augment the growth of the global data center market. The construction of hyperscale facilities spanning with an area of over 200,000 square feet across the globe will create lucrative opportunities for leading vendors operating in the global market. Companies such as Facebook, Google, Amazon Web Services (AWS), and Microsoft are amongst the largest companies focusing on the development of modular and hyperscale data center construction facilities. Colocation providers are investing millions of dollars and are focusing on the APAC and Middle East regions towards the deployment of new facilities. The increasing investments towards the development of a digital economy by laying submarine fiber cables, improving rural and urban broadband connectivity, and aiding in the establishment of new facilities that enable technological advancements will drive the demand in the global market. The extensive use of 4G LTE technology and upcoming 5G rollouts will increase the internet penetration and drive the growth of the global market. The emergence of edge computing is one of the primary factors fostering facilities development in secondary data center markets across the globe. The extensive use of services such as cloud, big data, IoT and artificial intelligence is prompting operators to adopt high-performance mission critical IT infrastructure in the global data center market. For more information, Order a sample. The increasing efforts to reduce power consumption, carbon emissions, and promote operational efficiency will attribute to the adoption of energy-efficient infrastructure in the global market. The leading vendors are investing in development of design innovation and implementation of advanced cooling systems is propelling the growth of the market. 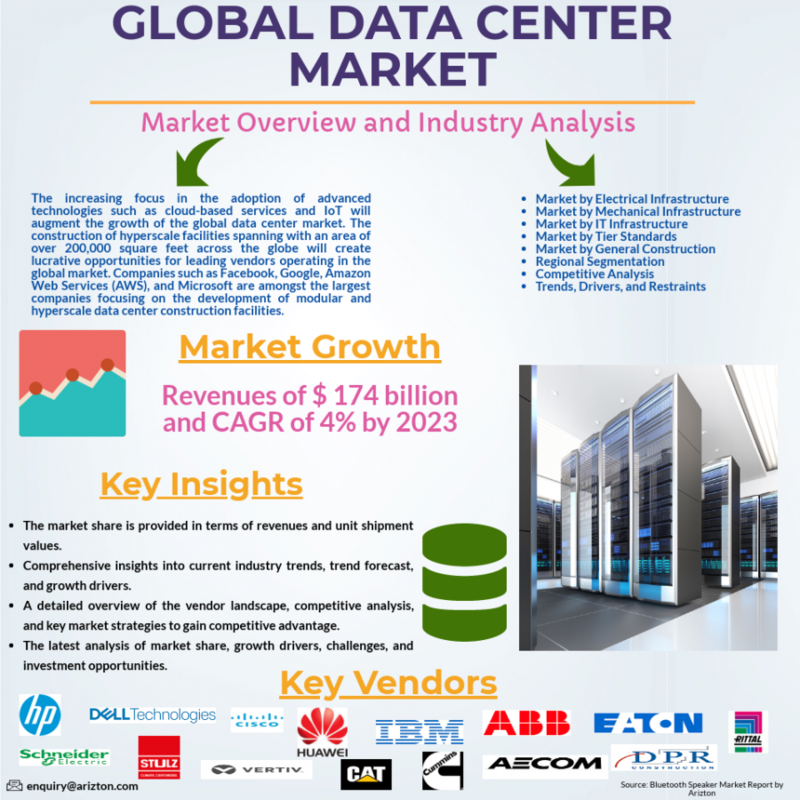 The global data center market is estimated to reach revenues of around $174 billion by 2023, growing at a CAGR of approximately 4% during the forecast period. The research report also offers market size in square ft area and power capacity in megawatts (MW) across geographies. The constant evolution of technological landscape and growing demand for modern facilities is augmenting the growth of the global data center market. The integration of storage systems such as hard disk drives (HDD), solid state device (SSD), tape storage, object storage, all-flash arrays, and hybrid storage arrays will transform the global market during the forecast period. The facility operators are focusing on procuring high-performance drives of 10,000 and 15,000 rpm, with a capacity of over 10TB per drive to improve the operational capacity of the facilities in the global data center market. The companies in the market are adopting all-flash storage arrays completely powered by SSDs and hybrid storage arrays powered by both HDDs and SSDs. These all-flash arrays are cost-saving alternatives that can perform highly critical functions in the global market. The increasing demand for all-flash and hybrid arrays will create lucrative opportunities for leading vendors operating in the global data center market. The increase in the workload of data centers with the integration of IoT and artificial intelligence (AI) will attribute to the demand for these arrays in the global data center market. The growing use of converged infrastructure platforms that simplify the process of integrating server, storage, and network infrastructure which also adds scalability to the business process will transform the global data center market. The hyper-converged infrastructure simplifies resource allocations between multiple workloads and effectively automates the process to reduce the administrative time of managing infrastructure in facilities across the globe. The three categories in the global market include software-defined compute (SDC), software-defined storage (SDS), and software-defined network (SDN). The colocation operators are adopting these IT infrastructures to process their workload as it offers simplicity, flexibility, scalability, and affordability to facilities in the global market. The leading vendors offering these infrastructures in the global data center market are HPE, Dell, IBM, Cisco, and Huawei. The growing deployment of cloud workloads such as AI, IoT, and big data will propel the demand for converged and hyper-converged infrastructure in the market. The rising demand for advanced technologies and cloud services from various industries such as BFSI, healthcare, government, and heavy industries will attribute to the revenues in the global data center market. The increasing requirement for high-performance computing (HPC) resulting from the adoption of converged and hyper-converged solutions and virtualization will drive the growth of the global market. The growth in the rack power density to an average of 8–10 kW is expected to increase in the data center market growth. With the increase in rack power density, the adoption of innovative and flexible facility designs with hot aisle containment systems and diverse electricity feed for racks will transform the global market. The mega and hyperscale data centers are equipping cooling and power infrastructure that can support rack power density up to 50 kW, and liquid immersion cooling that can support density up to 200 kW will boost the growth of the global data center market. The geographical segmentation in the global data center market is classified into North America, Europe, APAC, Latin America, and MEA. Americas occupied the largest market share in 2017, growing at a CAGR of over 2% during the forecast period. The billion dollar investments by colocation providers, hyperscale operators, enterprises, and government agencies is propelling the growth of the Americas in the global market. The US dominates the market when it comes to adoption of innovative infrastructure solutions such as all-flash arrays, hybrid arrays and hyperconverged infrastructure solutions. The increasing interest to procure renewable energy sources and low power cost sources will encourage operators to invest in the development of the market in Americas. The adoption of 2N redundancy configuration will grow among UPS systems and PDUs, while generators and cooling systems are still adopting N+1 or N+N configurations in the Americas. Innovations in power sources such as lithium-ion UPS systems, DRUPS, and fuel cells will propel the development of this region in the global data center market. Data Center Critical (IT) Infrastructure Providers: It include companies that sell IT infrastructure such as server, storage and network products. Data Center Support Infrastructure Providers: It includes vendor involved in providing power, cooling, rack, security, and infrastructure management products.